Until recently renewable energy sources were dominant energy sources. 150 years ago, wood, which is one form of biomass, supplied up to 90% of our energy needs. Modern interest in renewable energy development is linked to concerns about exhaustion and greenhouse gases of fossil fuels and environmental, social and political risks of extensive use of fossil fuels and nuclear power. In 2006, about 18% of global final energy consumption came from renewables, with 13% coming from traditional biomass, such as wood-burning. In 2008, consumption of renewable sources in the United States totaled 7.3 quadrillion Btu or about 7% of all energy used nationally. 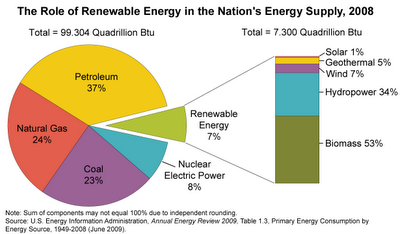 US renewable energy share. Click on the picture for full size. Despite the fact that famous theoretical physicist Albert Einstein is remembered for his work on relativity and gravity, he received his only Nobel Prize for work in renewable energy field. Einstein was awarded the 1921 Nobel Prize in Physics for his services to Theoretical Physics, and especially for his discovery of the law of the photoelectric effect. Biomass is currently the largest U.S. renewable energy source with more than 200 existing biopower plants now providing electricity for 1.5 million American homes. Manure-to-energy biogas projects are expanding and could power up to 3% of North America’s electricity needs. Distributed generation is a new renewable energy trend in the generation of heat and electrical power. The concept permits the consumer, who is generating heat or electricity for their own needs, to send their surplus electrical power back into the power grid or share excess heat via a distributed heating grid. Global strategies for accelerating the market penetration and diffusion of renewable energies need to engage both developed and developing countries. Governments can employ a number of strategies to improve the competitiveness of renewable energy. The new EU Directive on renewable energy sets ambitious targets for all Member States, such that the EU will reach a 20% share of energy from renewable sources by 2020 and a 10% share of renewable energy specifically in the transport sector. In 2007, the Government committed to ensuring that 20 per cent of Australia's electricity supply comes from renewable energy sources by 2020.